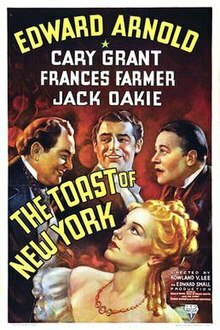 by Bouck White and "Robber Barons"
The Toast of New York is a 1937 American biopic directed by Rowland V. Lee and starring Edward Arnold, Cary Grant, Frances Farmer, and Jack Oakie. The film is a fictionalized account of the lives of financiers James Fisk and Edward S. Stokes. The screenplay was based on the book The Book of Daniel Drew by Bouck White and the story "Robber Barons" by Matthew Josephson. This is also Grant's first period film. In post-Civil War America, unscrupulous, ambitious partners Jim Fisk (Arnold) and Nick Boyd (Grant) talk tight-fisted businessman Daniel Drew (Donald Meek) into selling them his shipping company, paying with worthless Confederate bonds. Later, worried that his longtime rival, Cornelius Vanderbilt (Clarence Kolb), is trying to take control of his railroad, Drew seeks help from Fisk, only to have him turn the situation to his own advantage. Fisk and Boyd eventually become powers to be reckoned with on Wall Street. Meanwhile, both men fall in love with entertainer Josie Mansfield (Farmer). Mansfield agrees to marry Fisk out of gratitude, but really loves Boyd. Fisk's greed grows beyond all reason and he tries to corner the market in gold. When Fisk ignores Boyd's warnings, Boyd turns against him, worried that the resulting panic threatens the financial system of the whole country. The federal government finally intervenes by releasing its gold reserves, bankrupting Fisk in the process. The film was originally announced as The Robber Barons to star Robert Donat who had just made Count of Monte Cristo for producer Edward Small. Filming was meant to take four weeks but ended up taking fifteen with Arnold on $10,000 a week, half of which went to B.P. Schulberg who owned his contract. Costing Small this much money gave satisfaction to Arnold, who had been rejected by the producer seeking his representation as an agent in 1918. Costs blew out on the production and there ended up being at least seven writers on the script. Reviews were mixed. Frank S. Nugent wrote that it was "only moderately entertaining" and "a familiar formula Arnold show." Variety called it "good entertainment despite its inanities, extravagances and exaggerations." Harrison's Reports wrote that it was "lacking in dramatic force" and had unsympathetic characters but offered "several thrilling moments." Russell Maloney of The New Yorker called the story "fumbling and aimless" and found "shocking anachronisms" in the dialogue, concluding, "Not recommended." The film was a commercial disappointment, losing $530,000, making it RKO's biggest money loser of the year. This led to Edward Small leaving RKO and returning to United Artists. ^ Hanson, Patricia King, ed. (1993). The American Film Institute Catalog of Motion Pictures Produced in the United States: Feature Films, 1931-1940. Berkeley and Los Angeles: University of California Press. p. 2223. ISBN 0-520-07908-6. ^ "The Toast of New York". Turner Classic Movies. ^ HOLLYWOOD PICKET LINE: The Industry Watches the C. I. O.--Satisfaction--R. Halliburton Flynn By DOUGLAS W. CHURCHILL. New York Times (1923-Current file) [New York, N.Y] 18 Apr 1937: 169. ^ HOLLYWOOD ON THE ROAD By DOUGLAS W. CHURCHILL. New York Times (1923-Current file) [New York, N.Y] 21 Mar 1937: 173. ^ The New York Times Film Reviews, Volume 2: 1932-1938. The New York Times & Arno Press. 1970. p. 1411. ^ "Film Reviews". Variety. New York: Variety, Inc. July 14, 1937. p. 20. ^ "The Toast of New York". Harrison's Reports. New York: Harrison's Reports, Inc.: 127 August 7, 1937. ^ Maloney, Russell (July 31, 1937). "The Current Cinema". The New Yorker. New York: F-R Publishing Corp. p. 49. Wikimedia Commons has media related to The Toast of New York.